The Crosshatched 2013 team, Manohar Lal, Banay Singh, Ann Ferguson and I worked solidly for our 6 weeks together, all wanting to maximize the outcomes of what we could achieve in that time. Speaking for the group I can say we were all rewarded beyond our individual contributions. After the 6 weeks I was ready to do more, although that would have been unwise as by that time we were all exhausted and time for the Manori and Banay to return to their other families. We planned 3 main activities. Stacks Manori made ‘elements’ in 3 sizes that Ann, I and others, painted, burnished, cut, impressed and all combinations in between to create our own Stacks. This happened over a series of weekends. Friends and families came together to have a fun, productive and from all feedback a very enriching time. for more. The unknown factor in this was how the new wood firing kiln would perform or stated alternatively, would we know how to drive this new entity in the ceramic process. Some beautiful pieces thrilled us when the kiln was unpacked. We were impressed with what can be achieved on terracotta fired in this way from beautiful reds through oatmeal yellows and greens where the ash used in the making process was reduced* through to silken blacks where the pieces had been burnished with variations from one side to the other depending on what faced the flames. Not all were great, there were some that we refired and others abandoned. Crosshatched put together 3 pieces for the Tallarook Arts Show HeARTfelt. Earth, Fire and HeARTh 1,2 and 3. We were delighted to received the Mitchell Shire Award as well as selling the 3 pieces. *Reduction is an atmosphere common to wood firing. 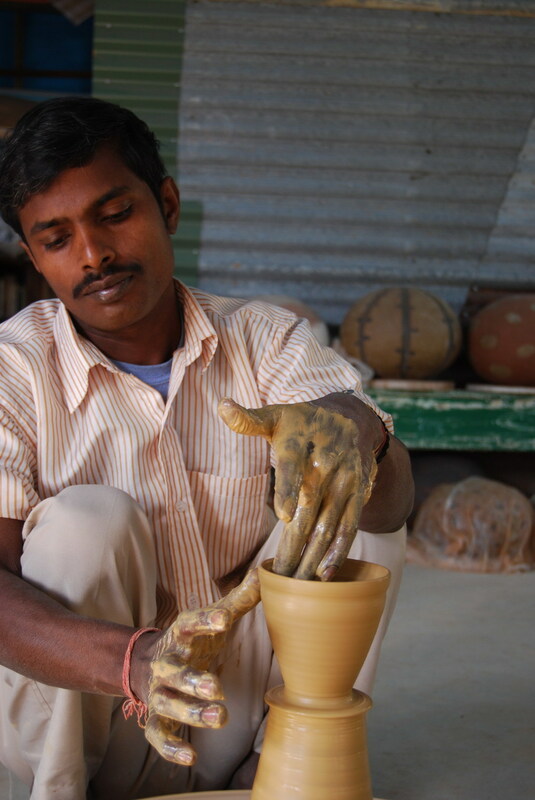 The oxygen supply is reduced by excessive fuel combusting and so the oxygen present in the clay and glazes is used giving different colours than would be obtained say in an electric kiln. Use and throw. 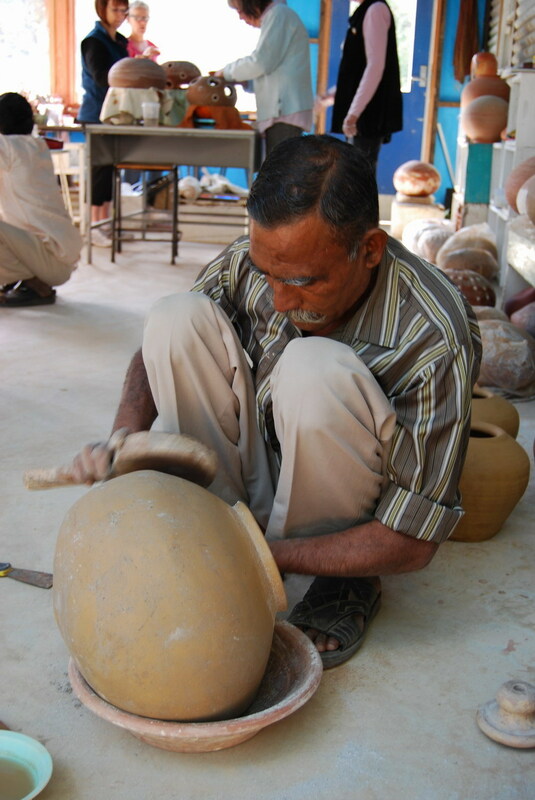 While the above was happening Banay Singh got down to making multitudes of chai cups to be low fired in a small traditional kiln. The idea of this was for him to begin working on what was familiar to ease his transition into Australia. The intention was to create sustainable* vessels in the tradition of the kulhad potters with the view to finding a way for these vessels into our food scene. We are still working on this. This was a prelude to him and me finally getting to working together on the 3rd element of out time together. * my new studio is not connected to mains power, the potters used traditional manual wheels and fuel for kilns is collected within walking distance from the site. Beakers bowls and other small vessels During my Asialink residency I had developed, in response to what I was seeing around me simple beaker and bowl forms. Banay and I worked on refining the forms he usually makes to meet our tableware aesthetic and needs. He made the forms and I then finished them on a kick wheel*. These were then bisque fired, glazed and then high fired. The intention is to have handmade, stackable, durable, functional objects for daily use available at a reasonable price made as sustainable as it reasonable. 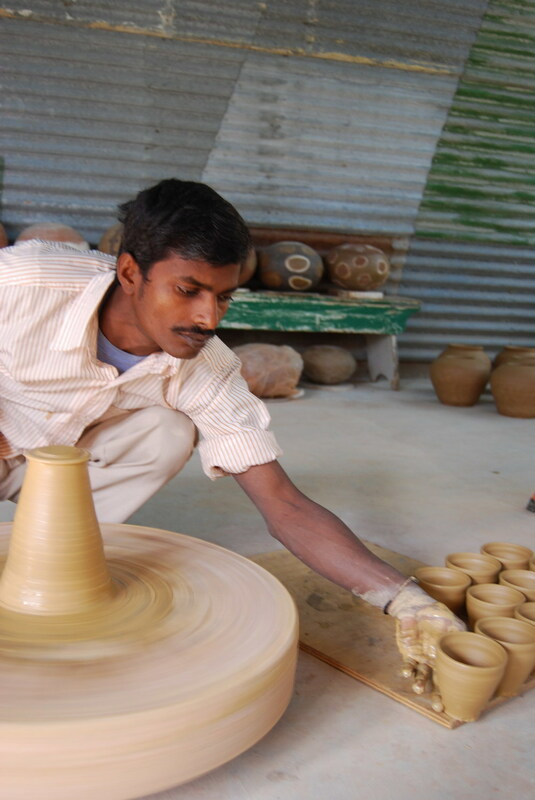 Read more * manually powered pottery wheel from the western tradition. We also did one day workshops at Tallarook Primary School, Seymour College as well as a most successful 2 days at The Melbourne University Early Learning Centre. Manori also made many matka( waterpots), these beautiful generous forms cool water effectively and are a great canvas for decorating. Along with Banay Singh’s chai cups they featured in MR KITLY’s collaboration with Supercyclers at DesignEx.